When I lived in Manhattan I lived on this salad. I would pick it up at Dean & Deluca if I was downtown or Zabars if I was uptown. Every gourmet deli sold a version of it. My favorites were the ones that tasted like Dorie's salad. Because Dorie's recipe is primarily Dijon mustard the sweetness of the carrots are not overwhelming. When I have had this salad with a sweet dressing I usually can only eat a few bits of it, especially if it contained sweet raisins too. Speaking of raisins, I thought I had currants on hand, but when I took them down from the cupboard the container said: cranberries. Well, I put 1/2 cup of dried cranberries in the microwave covered in water for 2 minutes and let them sit until I had the dressing and the carrots ready. I added them into the salad and they were wonderful. I like the cranberries more in the salad than the traditional raisins because their tartness counters the sweetness of the carrots. I don't recall the food of my college days in Philly being quite so virtuous. I've always been a bit of a "health nut". Love the citrus idea, oh yes I've had this salad with mayo it's awful. Rehydrating in orange juice sounds great. I like the idea of adding a citrus note to the dish. Do you have a teenager too? "I don't hate it." Looks delish. I made something like this once with grated carrot, apple, and raisins with lemon juice. I've been meaning to try it again and perfect it. Thanks for sharing!! You say lemon mj says orange juice... have to experiment. LOL on the family reviews...especially the "I don't hate it" one...sounds like days past here, no matter what one makes, there is always one who says, "Not my favorite." LOL...good memories. Your salad is beautiful. I can't wait until, "I don't hate it." is part of days past. Teens are tough. It´s good to have your whole family agree on a healthy salad! Enjoy the weekend! I lived on Long Island for years and this salad could be found in just about any deli you stopped in…then I found a recipe that was similar and for years this has been a family favorite!! I loved Dories dressing…very fresh tasting! Your salad looks wonderful…so glad it was enjoyed by (mostly) all!! Have a great weekend, Diane! You're so sweet, Diane! And, you're right, we do have a lot of dishes - LOL! We really enjoyed this & will definitely make it again. Have a lovely weekend! Everyone seems to have a story to go with this salad but you win, hands now, for having had a blast with your carrot food salad memory: 20s, Manhattan, clubing. Yes, I bet cranberries were good. Also think dried tart cherries would be also. My carrots were just out of the ground and very sweet. I added raisins but had cherries on hand. Wish I'd used them. I didn't mention that I lived with a model too. It was quite a seen hanging out with such tall skinny people. People always laugh when they meet me now and my husband tells them I was such a "party girl" when he meet me. "But your'e so preppy and Connecticut now." I really always was... I just returned to my roots when I got out of the city. Tart cherries... I like that. Love the comments from your family members, and the clubbing memories. Have a good weekend! This salad reminds me of my twenties, too. Funny that such a simple dish has been so evocative for many of us. I like the idea of cranberries with this. I'm amazed how many people have memories of this week's salad. It's completely new to me. Your salad looks lovely. I used walnuts instead of fruit in mine. Diane, nice and colorful presentation of your carrot salad and a wonderful story too! 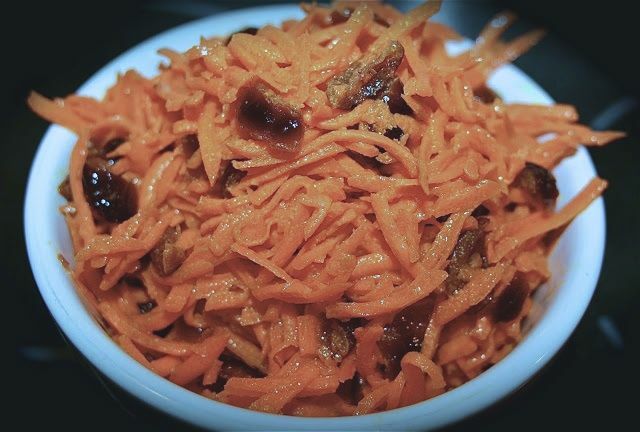 We love freshly grated carrot salad at our house and eat it on a weekly basis, so we loved this recipe of Dorie´s! Good to know. I eyed my dried cranberries while making this salad, but then decided to stick with the original this week. But I'll definitely try them next time. This looks like a gorgeous salad. I love carrot salad and I don't make it often enough!